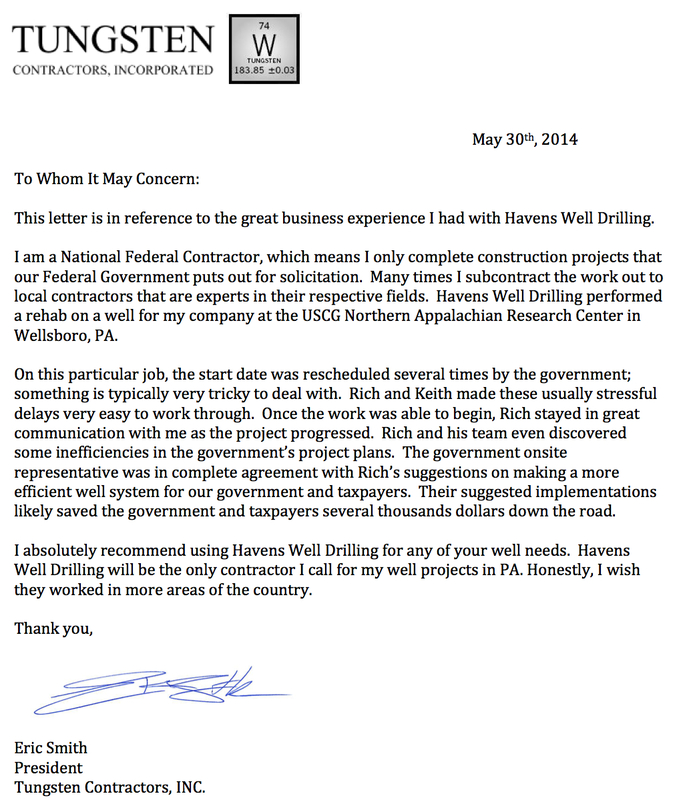 Testimonials | Havens Well Drilling Inc. Thank you so much for coming out on the holiday when our pump quit. We greatly appreciate your work. Thanks again. Thanks for getting the yard hydrant put on the well. It looks great and I really like it. Thanks again. Thanks for installing the water softener. I appreciate the results! We would like to express our sincerest gratitude for the fantastic service rendered recently. In our time of need, your communication was clear and your arrival was swift. Questions were answered thoroughly and without hesitations. The work was performed expertly with current technology and quality materials. All employees were professional and accommodating. Your attention to detail was phenomenal and your thoughtfulness during installation was greatly appreciated. You were able to fit us into your busy schedule not once, but twice and even stayed very late to finish the work. We feel you went above and beyond to fulfill our family’s needs. We would not hesitate to recommend you to family and friends and in fact, we already have. Richard and I want to thank you for the great job you did on our new well. We wanted to thank you for coming out to help us on Sunday March 8th. It is great to know we have a business in our community that is so willing to be there when you need them. Our animals are thankful as well. © 2019 Havens Well Drilling Inc.. All Rights Reserved.